Have you heard about Young Americans for Liberty (YAL)? 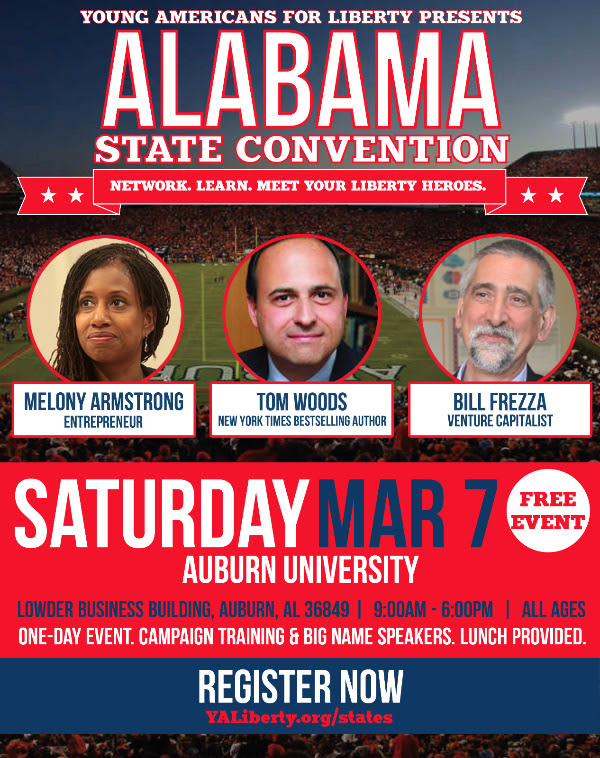 We would love for your home-schoolers to join us at Auburn University for the YAL Alabama State Convention. We have an awesome coalition of home-schoolers who will be in attendance. As a pro-homeschooling individual, I really appreciate all that the home-schoolers are doing to promote educational freedom! See the email below with details and let me know whether you (and your folks) can make it or not! I can't tell you how excited I am. In less than two weeks Young Americans for Liberty will host the biggest liberty event of the semester. YAL chapter leaders, State Chairs, and fellow liberty activists from acrossAlabama, surrounding states, and beyond will arrive for this event. Great speakers, amazing networking opportunities, expert campaign training... the list goes on and on. It's a must-attend event for anyone who cares about fighting for their freedom. It's coming up soon, so hurry and grab your ticket before it fills up! 1. Amazing speakers: Senior fellow at Mises Institute Tom Woods, entrepreneur Melony Armstrong, and venture capitalist Bill Frezza will keynote. Plus we'll host professional campaign instructors, state and local leaders, and YAL staff. 2. Prepare for 2016: Learn at the premier "Campaign Bootcamp" training to prepare the most committed activists for the upcoming 2016 elections. It's a crash course in campaign training for every activist who wants to "win on principle." 3. Free lunch & gas for carpools: Everyone gets a free lunch, and YAL will reimburse up to $100 in gas for a car with four or more passengers. So bring your whole YAL chapter and your friends. All activists of all ages can attend. 4. Resources from sponsors: Many national and local groups will be there passing out their information on activism grants, training, and educational materials. Plus, you'll get a free tote bag full of liberty swag. 5. Networking: Meet people just like you looking to make a difference for the cause of freedom. There will also be job and internship opportunities offered by our sponsors. 6. Post-event social: Sometimes the best stories are told and strategies developed after the State Convention. Stay around for dinner and drinks to mix and mingle with your fellow patriots. With so many reasons to attend, how could anyone stay home?